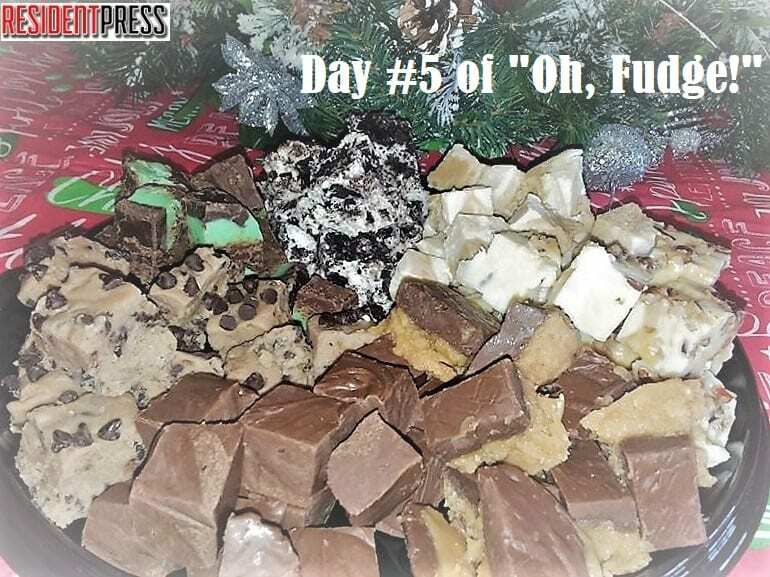 Day #5 of "Oh, Fudge!" 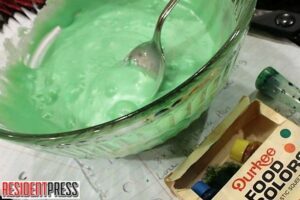 brings you Remi's Mint Chocolate Fudge! Mint chocolate is one of mine and my daughter’s favorite candies to indulge in. When I found this recipe, I knew I had to try this fudge! It has three layers, but the recipe isn’t too complicated to make. Christmas is all about peppermint candy canes and this fudge is a delight that you won’t want to pass up! One December evening, all was quiet in the Boyd house. Not a creature was stirring, not even a mouse… OR so it seemed… However, little did we know that little baby Remington had snuck into the living room all by himself while the rest of us were busy and off in other rooms. 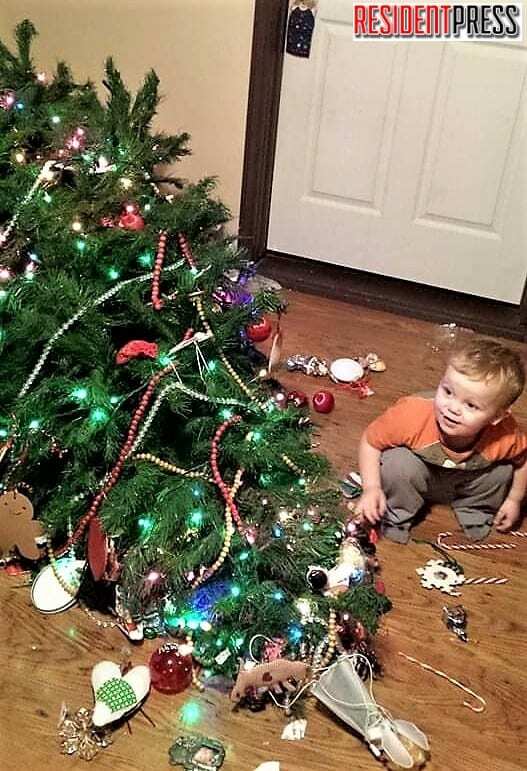 It must have been a shiny ornament on the Christmas tree that caught his eye or possibly the blinking lights. I’m sure he thought just one little tug on the peppermint candy cane would be ok. If he only pulled it a little, he could get it close enough to taste. However, one little tug turned into one big disaster. As my oldest daughter came running and saw the mess, she dropped to her knees and started to cry as she picked up shattered ornaments, one even being her first baby ornament now shattered to pieces. This was one Christmas I will never forget! My daughter cried for an hour trying to fix ornaments and we tried to salvage the tree. However, when we went to lift the tree to stand it back up, it snapped loudly and broke into two pieces crumbling back to the ground. We even tried to “red neck it” and use duct tape to put the tree back together. However, it didn’t work. I needed a minute to decompressed after cleaning up the mess and stepped out onto the porch to get fresh air, and there set a brand-new Christmas tree that someone had delivered to our front door step. Could it be Santa’s Elves coming to the rescue? The kids all squealed with excitement because Christmas had been saved! So, we undecorated the broken tree, and by midnight we had our new tree up and looking beautiful! Not every family can say they have decorated their Christmas tree in one day, took it down in one day, and decorated the tree again in one day! 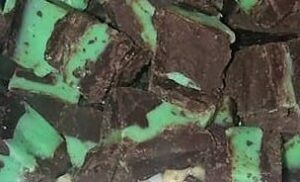 So, for Day #6 of “Oh, Fudge!,” I bring you Remi’s Mint Chocolate Fudge in honor of little baby Remington going for his peppermint candy cane on the Christmas tree! This creamy three-layer mint chocolate fudge will be the best mint fudge you have ever savored in your mouth! 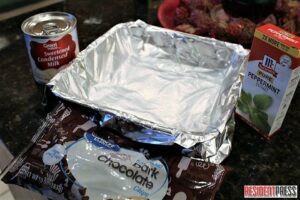 Line an 8×9 pan with foil or parchment paper and spray it with cooking spray. Next, melt 1 ½ cups of milk chocolate chips, ¾ cup of the dark chocolate chips, and ½ can of sweetened condensed milk in a microwave safe bowl for 90 seconds. Remove and stir until completely smooth. Pour immediately into the pan and place into the refrigerator while you make your next layer. In another microwave safe bowl, melt the white chocolate chips and the other half can of sweetened condensed milk in the microwave for 30-90 seconds. Remove and stir until smooth. Return it to microwave if it isn’t completely melted but do not overcook. Add peppermint extract and stir. Add a couple of drops of green food coloring and stir. Mix well. Pour this layer on top of your previous layer that you have already made and return the fudge back to the refrigerator Now, it is time to make your last layer of fudge. Take 1 cup of Milk Chocolate Chips and butter and melt in the microwave for 20 second intervals. Stir each time you have to heat. Do NOT over cook or it will be very hard to spread this layer on top. Pour this mixture over the mint layer. Chill for 2 to 3 hours until fudge has hardened. This fudge can be stored and good for up to two weeks in the refrigerator.